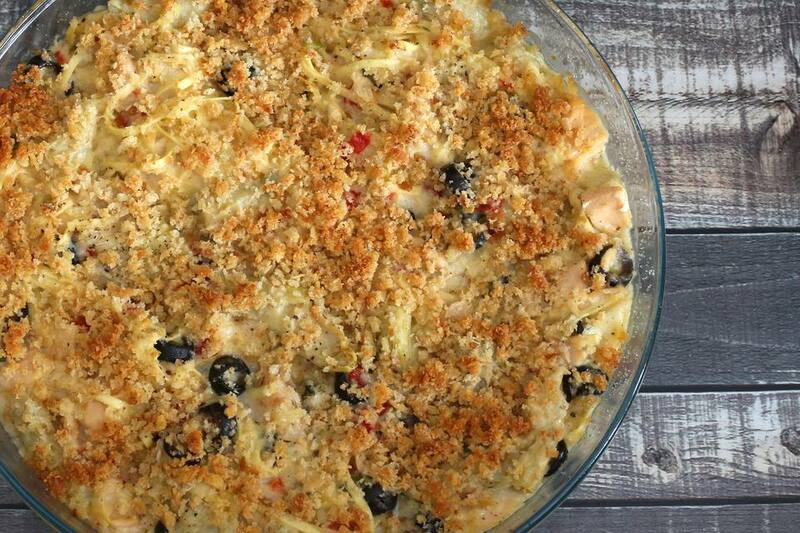 My family loves the great variety of flavors in this delicious, out-of-the-ordinary tuna noodle casserole. Not only is it loaded with flavor, it has great color and texture. Feel free to leave the mushrooms or olives out, or add some peas to replace an ingredient. If you don't care for a breadcrumb topping, top it with an extra 1/4 cup of Parmesan cheese instead. Cook the noodles in boiling salted water following the package directions. Drain well and set aside. Lightly butter a 2 to 2 1/2-quart baking dish. In a large saucepan, melt 3 tablespoons of butter over medium-low heat. Add the green onions and saute for 1 minute. Stir in flour and continue cooking, stirring, for 2 minutes. Gradually add the milk; cook, stirring, until thickened. Add the seasonings to the milk along with the artichoke hearts, olives, pimientos, mushrooms, and 1/2 cup Parmesan cheese. Cook the sauce, stirring, until the Parmesan cheese has melted. Add the flaked tuna; taste and add salt, as needed. Stir in noodles. Melt the remaining 2 tablespoons of butter; toss with the bread crumbs until well coated. Add 1 or 2 tablespoons of grated Parmesan cheese to the breadcrumbs. Sprinkle the crumbs over the casserole. Bake for 25 to 30 minutes, until hot and bubbly and the topping is browned.